Reporting preliminary research results in table form can be a daunting task, specially when you’re trying to make sense of what your SQL queries actually does. You don’t want your editor to set the story off in the wrong direction just because you forgot to point out some crucial piece of information in the table description. Should have put some comments in that SQL file, huh? Well, that’s what the mkres utility makes you do: Write comments above your SQL statements, explaining exactly what went through your head while writing the query behind a specific table. Your comments will the be nicely embedded into a human-readable PDF report. In an effort to reduce the time spent on creating long paste-up’s of ASCII-art tables from mysql’s command-line client, i wrote a simple script that would generate a legible PDF document directly from the SQL script, using the content in the comment blocks as the source for structure and textual content. 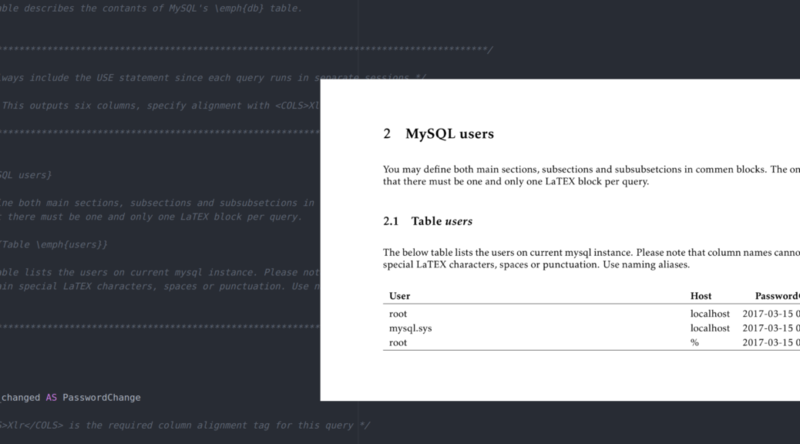 In fact, mkres needs those comments to work well, because they will be nicely displayed alongside your output tables when redering the PDF document from your SQL file. It sometimes happens that such trivial problem-solving scripts grow into full-blown GitHub projects. Not quite so yet, but I do believe mkres might come in handy for anyone doing quick-and-dirty database research with SQL scripts. So, I’ve published the bash script for you to try it out. It’s all based on good old LaTEX, a widely used document preparation system. You will have to learn some basic LaTEX tags, but that shouldn’t intimidate anyone familiar with scripting and query languages in general. One comment block per SELECT query, should be embraced by /******* and ********/ style lines. Only one <LATEX> tag per comment block. Everyting that should be included in the PDF goes there. Other comments are put outside this element. You may have several queries after a comment block, but only one of them is allowed to output a result set (the table contents). Include a <COLS> tag (see below) for each SELECT query to have your table correctly formatted. Column headings (field name aliases) should not contain anything but ASCII characters and numbers. No symbols, no white spaces. No nordic characters. X Content is left-aligned, and the width of the column is expanded so that the table fits the page width. One of the columns (usually the first one) should be formatted with an X.
I’m not a bash programmer. Gotta be lots of WTF’s in the code, so feel free to submit your pull requests! The script is published under GPLv3. The script works on Linux systems, but it has lots of dependencies. Running it in my espena/latex Docker container should be the preferred way. The Dockerfile for the image is found here, if you’d rather build it yourself or modify it in any way.